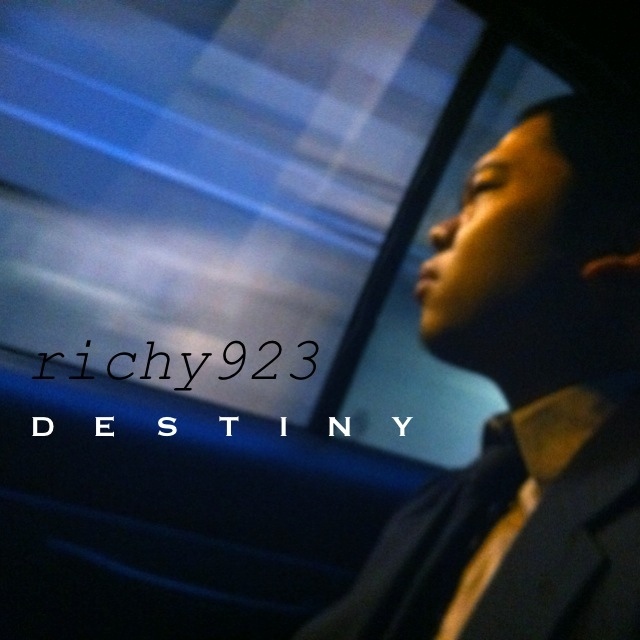 Destiny 2011 | Richy923: Published! I’m currently developing my next full length album, titled “Destiny”. Here’s the album cover. I like to start backwards with the artwork developed first. Having a visual to work towards keeps me more productive. Aiming for late spring 2011. Story-wise, it continues from “King Friday” and will serve as a bookend to 2008’s “face:the.music” like the third chapter in a trilogy. Production and composition-wise, I’ll of course have to push my limits further. More lead guitar, more range in vocals and harmonies, more groovy bass lines… And style-wise, although I do want to go back to more pop-punk styles to reflect “face:the.music”, I plan to incorporate some 60’s garage and funk as well as some epic-sounding prog rock. I’m hoping to create a more dynamic masterpiece this time around. Not to say it’s going to be a darker album overall, but some songs will get pretty deep while others will maintain that pop-punk edge. I’m hoping everything I’ve learned along the way, musically, thematically, lyrically and at the production level, will converge in this new project. And the reason I’m doing this so soon after the release of King Friday is a little bit of a personal experiment of my own. I don’t really like to discuss song meanings and get all artsy-fartsy on this blog, but I’ll say this much; I guess it’s no secret that the past couple of albums are a loose interpretation of my past few of years. For all writers, it’s always “write what you know”. This time I want to have a little bit of “write what will be” and see if we have the power to write our own… destiny. Ooooohh!!! This entry was posted on November 29, 2010 by richy923. It was filed under Uncategorized and was tagged with destiny, preproduction.